Keith and I love trying new recipes, or spin-offs of old ones. Stuffing vegetables is a great way to eat healthy and be inventive! 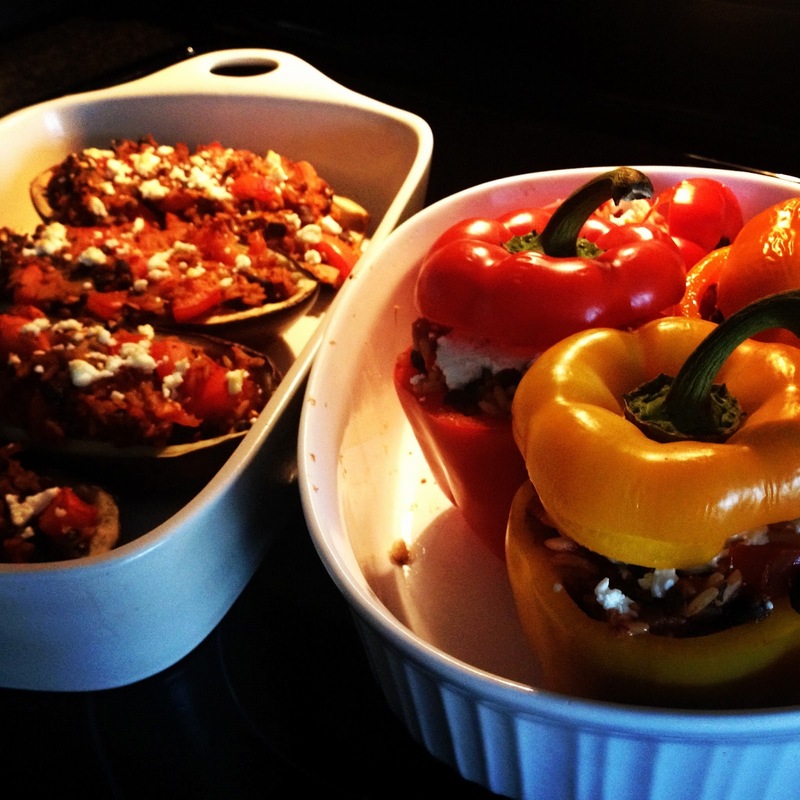 We used the recipe below to stuff colored bell peppers and eggplants! They were all delicious! 1. preheat oven to 350 degrees (180 Celcius). if stuffig eggplants or zucchini, trim the stems, then halve lengthwise. use a teaspoon to hollow out each half, leaving a shell about 1cm thick. chop the scooped out flesh. steam the shells over boiling water for about 4 minutes, then hold then under cold water to stop further cooking and dry with paper towels. mist the insides with oil-and-water spray (we like Pam Extra Virgin Olive Oil spray). if stuffing bell peppers, slice off the tops (put to the side), then scoop out and discard the seeds. if stuffing tomatoes, slice off the tops (put to the side), then scoop out the seeds and flesh, and add the flesh to the rice mixture in step 2. 2. heat the stock in a skillet, then add the onions and garlic to saute, stirring, until translucent. Stir in tomato paste, tomatoes, chopped eggplant or zucchini flesh (if using), cooked rice, pine nuts, herbs, and cinnamon and continue cooking for a couple of minutes. 3. stir in the lemon juice and season with pepper. lightly mist a baking dish with oil-and-water spray. stuff the vegetables with the rice mixture, add cheese if desired, and put the lids back on the peppers or tomatoes (if using). bake for about 20 minutes. recipe adapted from "The Fitness Food Cookbook"